There are diverse environmental and genetic causes for under eye dark circles. Dark circles caused by thinning skin, inflammation, or fatigue can be improved with under eye creams and serums. Dark circles caused by genetics or bone structure cannot be improved with topical applications. Creams or serums containing clinically proven active ingredients, such as caffeine or niacinamide, can help to reduce puffiness, and plump up the skin under the eyes. Products work best when applied regularly. For more permanent, dramatic improvements, surgical procedures like blepharoplasty are an option. Dark circles beneath the lower eyelids, or periorbital hyperpigmentation, are a common aesthetic concern that tends to be more common among women than men. They typically impart a fatigued and aged appearance to the face. Dark circles are caused by diverse environmental and hereditary factors. Sometimes a combination of causes are responsible for their appearance. It is vital to differentiate whether the under eye darkness is due to darkened skin, or is instead shadowing resulting from a sunken tear trough or bone structure. To determine the cause, the lower eyelid skin can be gently, manually stretched. Pigmented under eye skin retains its color when stretched. Shadowing under the eyes will improve or resolve entirely. Eyelid skin is one of the thinnest areas of skin found on the body. With age, collagen production begins to slow down so the blood vessels beneath the surface of the skin become more visible. Fat loss and skin laxity beneath the eyes also contributes to the thinning of eyelid skin. Under eye circles that result from allergies are called allergic shiners. Congestion of the nose and sinuses cause dark pigmentation to appear beneath the eyes, creating an effect similar to bruises. Histamines released by the body cause the blood vessels beneath the eye to dilate and become more prominent through the skin. Dermatitis of the eyelids causes an inflammatory reaction. The skin of the eyelids is very sensitive to irritants and allergens. Dermatitis can be caused by contact with a trigger substance, or may be chronic (eczema). Swelling, itching, or burning may result, and the under eye area will appear darkened. Inadequate sleep can make the skin appear pale, accentuating undereye circles. Lack of sleep can also cause fluid retention. Puffiness under the eyes can cast shadows, causing the under eye area to appear violet. Dehydration can result in a sunken, dry appearance under the eyes. Prolonged staring at a screen can strain the eyes and cause the blood vessels to enlarge, contributing to a darker under eye appearance. Under eye creams and serums can help diminish the appearance of under eye circles. Individuals with thin, translucent skin are more likely to experience prominent dark shadows beneath the eyes. Individuals of Asian or African descent are more prone to experience increased under eye pigmentation. Individuals with prominent cheekbones or brow ridges may experience shadows under the eyes due to their facial anatomy. A prominent tear trough gives the eye a sunken appearance. As subcutaneous fat beneath the eye begins to descend with age, dark shadows are cast under the eyes. Many people believe they have dark circles, when in fact the hollowness of the tear troughs (or infraorbital hollow) causes a shadow that only “looks” like dark circles. An easy way to determine whether you have dark circles or not is to look upwards at lighting above you – if the “dark circles” go away when you look up, it’s more likely a hollowness issue that can only be fixed with dermal fillers. Preventing dark circles is preferable to treating them once they’re already apparent. The following techniques can help to ward off under eye circles caused by environmental and lifestyle factors. Highly processed foods often contain excessive quantities of sodium. Reduce your intake of sodium-rich snack foods such as potato chips as they encourage fluid retention. Opt for low salt options, and eat plenty of hydrating fresh fruit and vegetables. Try to sleep on your back with your head and chest slightly elevated. This encourages fluid to drain away from the face. Regular hydration keeps the delicate skin under the eyes plump and firm. 7-8 hours of sleep helps to keep the skin glowing. There is a variety of straightforward natural treatments you can try at home to combat the appearance of under eye circles. These are targeted at reducing dark circles caused by inadequate sleep, irritants and allergens. Tea contains caffeine and antioxidants that help constrict the blood vessels beneath the eyes, stimulate blood circulation and reduce fluid retention. Soak black or green tea bags in boiling water, then leave them to chill in the refrigerator. Once they’re cold, the tea bags can be applied to the eyes for 15-20 minutes. A cold compress gently applied beneath the eyes encourages the constriction of blood vessels, helping to reduce the appearance of dark circles. Cucumber contains antioxidants that can help to brighten the appearance under the eyes. It also has an anti-inflammatory effect to help reduce swelling and puffiness. Place thick slices of chilled cucumber over the eyes for ten minutes, then gently rinse the treated areas. There are prolific eye creams and serums available that guarantee to vanquish dark circles. Of the many topical treatments on the market, some offer superior results because they include active ingredients that have been clinically tested to support the delicate periorbital region. Our top five products include powerhouse natural ingredients, which are ideal for diminishing under eye darkness. Deciem’s The Ordinary Caffeine Solution boasts a dynamic combination of 5% caffeine teamed with EGCG catechin sourced from green tea leaves. Caffeine works to constrict blood vessels, reducing discoloration, while EGCG helps to diminish inflammation and re-hydrate skin cells. ROC’s Retinol Correxion Anti-Aging Eye Cream uses a dermatologist-tested retinol formulation that’s ideal for renewing the skin under the eyes and eradicating dark circles. Dermatologists have long been devotees of retinol for its skin-regenerative properties. Retinol is a derivative of vitamin A and helps to accelerate skin cell turnover. Dull, aged skin cells are removed and replaced by new, fresh skin cells. 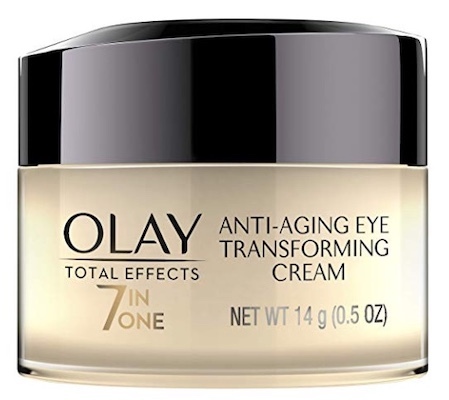 Olay Total Effects 7-in-1 Anti-Aging Eye Cream incorporates niacinamide with mineral pigments to diffuse light, softening the appearance of undereye circles. Niacinamide, a form of vitamin B3, is a natural, water-soluble vitamin. It improves the skin’s barrier function by preventing the loss of water. It helps to reduce the appearance of dark circles by strengthening the surface of the skin. Niacinamide can also help diminish dullness and hyperpigmentation, by extension lightening and brightening the under eye area. 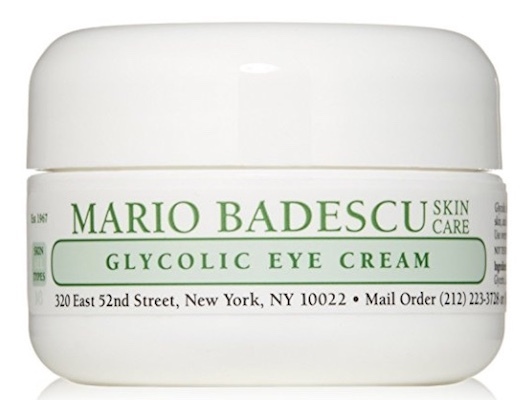 Mario Badescu’s Glycolic Eye Cream harnesses glycolic acid to address uneven tone and texture. The result is more radiant, smoother under eye skin. Glycolic acid works by gently exfoliating the skin. When applied, it provokes a chemical reaction that loosens dead skin cells from the outermost layers. The result is a smoother, more even under eye appearance, helping the delicate skin beneath the eyes to better reflect light, so it glows. 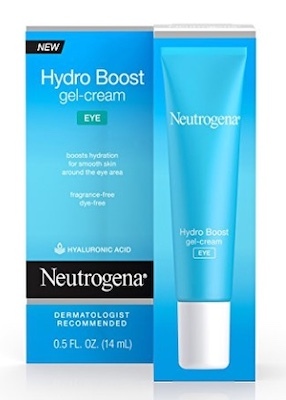 Neutrogena Hydro Boost Gel Eye Cream with Hyaluronic Acid contains purified hyaluronic acid, to rapidly quench the under eye area. Hyaluronic acid is found naturally in the body, with the molecules able to hold 1,000 times their weight in water. When applied under the eyes, it attracts moisture to bolster and plump the skin’s appearance, thus minimizing the visibility of the blood vessels. Fragrance free and oil free. Medical treatments can specifically target the cause of the under eye circles and dramatically improve or permanently remove them. A consultation with an experienced, board-certified dermatologist or plastic surgeon is instrumental in determining the cause of your under eye pigmentation or shadows, and selecting the appropriate medical treatment. PRP is a regenerative treatment which encourages the body to increase production of collagen around the eyes, helping to plump thin skin and reduce the appearance of dark circles. This is a surgical procedure performed to smooth out and remove excess puffy skin from under the eyes. Some variations of the procedure can also redistribute under eye fat. Hyaluronic acid dermal fillers can be injected into prominent tear troughs to fill out hollows under the eyes, restoring volume. Lasers can help reduce the appearance of dark circles caused by hyper-pigmentation or prominent blood vessels under the eyes. The Q-switched laser has been shown to be particularly effective. Mild chemical peels can represent a good approach to improving the appearance of dark circles caused by hyper-pigmentation. Read a cosmetic doctor’s view on chemical peels for under eye circles here. If you suffer from under eye circles, determining the cause or causes is essential to selecting a successful treatment. Clinically tested under eye products that target thinning skin, puffiness, or fatigued eyes can help to soften the appearance of dark circles. For a more dramatic or permanent correction a medical treatment may be preferable. You can use our doctor directory to find a nearby qualified cosmetic doctor to help you determine the most suitable treatment approach.